An Annotated Catalog of Marina and Recreational Boater Pollution Education Materials. California Coastal Commission: Why it Exists and What it Does. See it in PDF or e-mail us to request a free copy. California Supreme Court decision decision in Marine Forests Society et al. v. California Coastal Commission et al.:. Questions and Answers on El Niño , California Coastal Commission (includes preparedness checklists for shoreline property , slope protection & preparedness , and general property preparedness ), 1997. The latest volume in our series of coastal guides is now available! Marin, San Francisco, San Mateo, Santa Cruz, Monterey Counties. and then find out more! 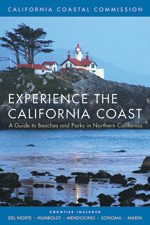 The third volume in our series of coastal guides is now available! Each in this series is devoted to a portion of the coast. This volume includes sections on Los Angeles, Orange and San Diego Counties. Take a peek at sample pages from the Los Angeles County chapter and then find out more! Below is the cover of the second volume in this series. 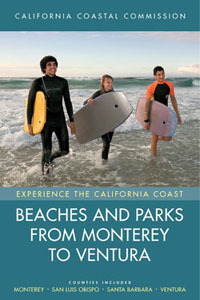 This volume includes sections on Monterey, San Luis Obispo, Santa Barbara and Ventura Counties. Below is the cover of the first volume in this series. Each is devoted to a portion of the coast. 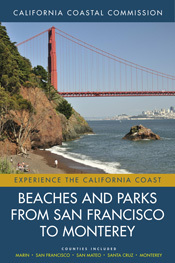 This volume includes sections on Del Norte, Humboldt, Mendocino, Sonoma, and Marin Counties. See the press release about the guide. 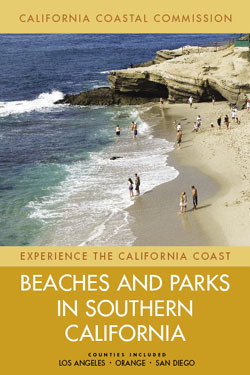 Broad Beach Public Shoreline Access Guide, California Coastal Commission, Public Access Program, July 2004. This is in PDF. To read/print this, you need the free Adobe Reader. To get it, click here. California Coastal Access Guide, California Coastal Commission, published by University of California Press, 2003 [Updated edition]. Completing the California Coastal Trail [12 MB], California Coastal Conservancy, January 2003 and California Coastal Trail maps [in PDF, 7.25 MB], California Coastal Commission, et al. Coastal Stewardship - Vision 2020 Hindsight, Insight, Foresight presented by Peter Douglas at The Coastal Society 16th International Conference, Williamsburg, Virginia, July 12, 1998. Enforcement Program Annual Report 2004, California Coastal Commission. Status of the LCP Program: FY 97-98 Annual Report. California Coastal Commission. October 1, 1998. Status of the LCP Program: FY 98-99 Annual Report. California Coastal Commission. January 13, 2000. ReCAP...what is it? Overview of ReCAP Pilot Project. California Coastal Commission (1997). ReCAP Pilot Project. Findings and Recommendations: Monterey Bay Region. California Coastal Commission Regional Cumulative Assessment Project. September, 1995. ReCAP Pilot Project Findings and Recommendations: Monterey Bay Region. Executive Summary. California Coastal Commission Regional Cumulative Assessment Project. September, 1995. Letter to Nuclear Regulatory Commission to Comment on Proposed Federal Rule Change Regarding Geologic and Seismologic Characteristics for Siting and Design of Dry Cask Independent Spent Fuel Storage Installations (ISFSI) and Monitored Retrievable Storage (MRS) Installations. Procedural Guidance for the Review of Wetland Projects in California's Coastal Zone. California Coastal Commission. June 15, 1994. Restoration of Unpermitted Development within the California Coastal Zone. Prepared as a presentation to the Society for Ecological Restoration Conference, Seattle, Washington, September, 1995. The Commission’s technical oversight and independent monitoring program provides for periodic review of the status and performance of the SONGS mitigation projects. On the UCSB SONGS Mitigation site, you can find background information as well as a collection of project documents, images, information about SONGS staff and public workshops. Below are documents we house on our site.